10% off – Linn @ 45 Summer Promotion starts today! Today marks the start of Linn’s annual Summer Promotion and this year, in keeping with the weather, it’s a sizzler. 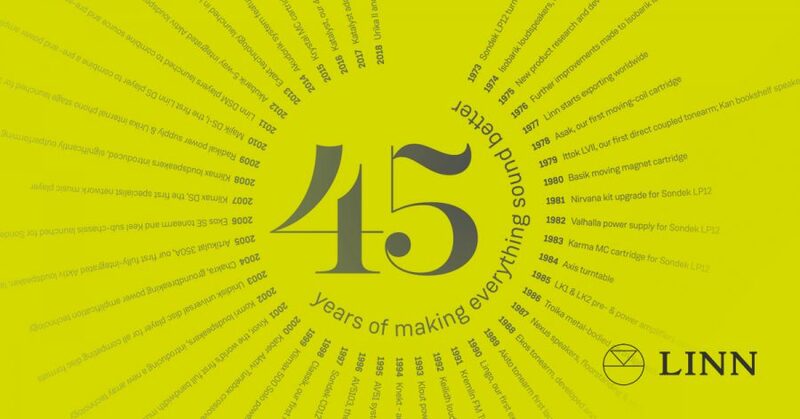 To celebrate it’s 45th birthday, Linn is giving 10% off any new Linn product* when you trade in an old one. And that’s on top of any part-exchange we give you. Win win. The 10% discount applies to all current Linn complete systems (Klimax, Akurate, Series 5, Majik and Kiko); separate components from the Klimax, Akurate, Series 5 and Majik ranges and also complete turntables. *Excluded from the 10% discount: turntable components, LP12 upgrades, Linn Cartridge part-exchange values, upgrades & accessories and custom install products. Your legacy Linn product for trade-in doesn’t need to be working and nothing is too old; pretty much everything is accepted – old source products (including Axis and Basik turntables and legacy LP12 components), speakers or Linn amplifiers – all the way back to the original LK1&2. Your have 8 weeks to take advantage, the promo ends Monday 27th August. Go!